Using several commentaries we will study, contemplate and meditate on this wonderful text. “To practice effectively you must know how to do so. The Lamp indicates clearly and concisely how to practice. It contains the quintessential thought of past, present and future Buddhas. 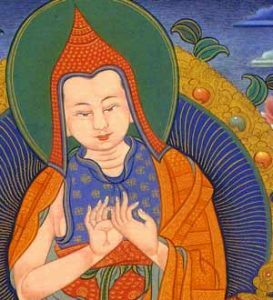 Since people’s abilities, dispositions and interests differ, Atisha, one of the greatest Indian masters of his time, shows how this subject – matter may be practiced by those of three different capacities.” Quote from Geshe Sonam Rinchen. Course structure: A monthly meeting at the centre with a programme of practices to do at home. Donation: R50 per session, plus dana for Alan. Atīśa Dīpaṃkara Śrījñāna (982 – 1054 CE) was a Buddhist Bengali religious leader and master from the Indian subcontinent. He was one of the major figures in the spread of 11th-century Mahayana and Vajrayana Buddhism in Asia and inspired Buddhist thought from Tibet to Sumatra. In 1013 CE, he traveled to the Srivijaya kingdom and stayed there for 12 years and came back to India. He is recognised as one of the greatest figures of classical Buddhism, and Atisa’s chief disciple Dromtön was the founder of the Kadam School, one of the New Translation schools of Tibetan Buddhism.